In 2009, two creative women got together to share ideas on presenting quality information to busy women in Northwest Ohio . . . and “Happenings” was born. The positive response and immediate success of the publication was beyond their expectations. Mary Beth Weisenburger, owner of FreeBird Publishing and Promotions was the Editorial Director of Happenings since its inception until the end of 2017. Mary Beth had over 25 years of experience in marketing, public relations, editing and publishing. Yvonne Dale, owner of YDGraphics, served as Creative Director for Happenings through 2013. 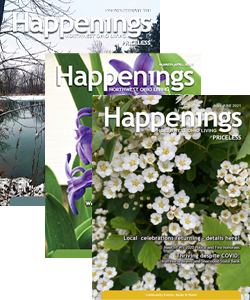 "Happenings" is locally owned, designed and printed. Each issue includes articles on timely topics such as healthcare or gardening that are contributed by local professionals. Every stage of production, from design through editing and printing are handled right here in Northwest Ohio. Now in our ninth year of production, we are continuing to strive for an excellent and relevant publication while expanding our advertising and distribution base. With these goals in mind, The Hubbard Company has assumed control of the publication and will contribute resources to expand the reach of the publication. Beginning January of 2018, Faith Smith assumed the role of editor to assure consistency and the high quality that the “Happenings” is known for.